What makes a startup choose a certain type of technology that again makes up very different technology stacks? 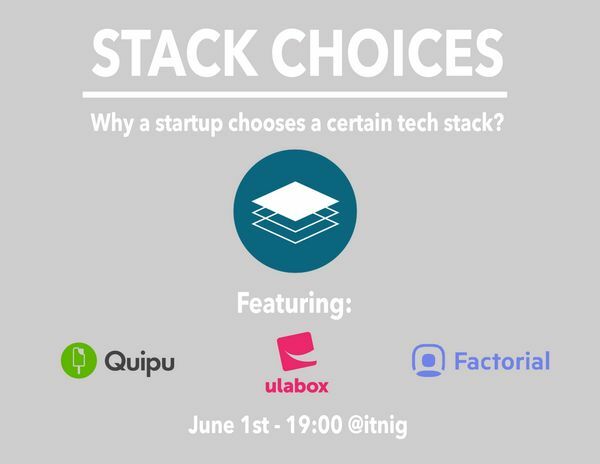 We'll have CTO's and senior developers from Ulabox, Quipu and Factorial explain their stack, why the stack looks like it does and what kind of challenges they've faced with because of their tech stacks. And of course, bring your questions, these guys knows their stuff! Senior developer Ruben Sospedra about some of Ulabox' stack: React and React Native, PHP7 with Symfony 2, Solr and SQL for databases, Twig with jQuery and Redis for web, Angular web app with ionic, docker master race, etc. CTO Pau Ramon about some of Factorial's stack: React, Mobx, Flow, Babel, Webpack, CSS modules, etc..) and an API built in Rails, etc. CTO Albert Bellonch about some of Quipu's stack: Our current stack is Emberjs, Rails, MySQL, Redis, Memcached, Wordpress, Cordova, and more.. The three of them will quickly go through the stacks, pro's and con's and then we'll leave it open for questions, as well as enjoying some cold La Brava's later on!